"It is important that our small guys can learn from professional players", says Konstantin Igropulo. 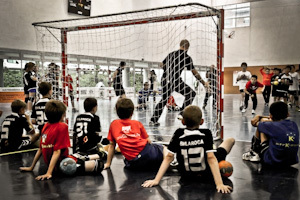 This is the reason why Tino is doing special handball camps for children. Every year he was spending a part of his vacation with his own handball camps in Spain and Russia. In future he is planning to do camps in Berlin also, as Tino is learning German language right now. "I want to be a connector between the generations and I want to give something for the future development of handball", Konstantin Igropulo says.